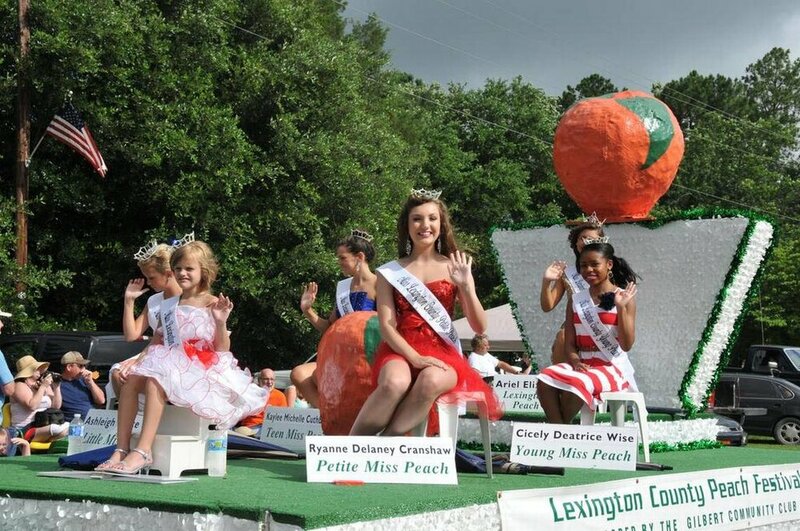 Register for the Peachy and Patriotic Parade at the Lexington County Peach Festival. Find tips for a great parade entry and more! Welcome to the Peach Parade registration page! Please review the tips for a great parade entry below before submitting your parade application! When considering your parade entry, keep in mind you are helping put on an amazing show! More 30,000 people attend our event every year -- and a large portion of our guests come for the parade! Entries may be historical, humorous, or modern in design, so long as they are in good taste. Those planning entries should remember that this is a family event that a large part of the audience will be children. It's ok to be generous! and use of peaches, patriotism and diamonds or their likeness. special ribbons for high point division winners. There are no cash prizes. Please complete the application form only after reading the Parade Guidelines. By applying to participate in the Patriotic and Peach Parade, you agree to abide by all regulations set by the Lexington County Peach Festival. The deadline to apply is June 20, 2019.
Who is the party that will be represented in the parade entry? Ex. Float, Band, Car, Walking Unit, Etc. The Lexington County Peach Festival Parade Committee and the Festival Officials reserve the right to remove any participant not adhering to the Parade Rules and Regulations, or found to be performing activities not in keeping with Festival traditions. In consideration of the acceptance of this entry, I hereby for myself, my heirs, executors, administrators and assigns, release and discharge the sponsors and operator of the Peach Festival and their agents and employees from any and all claims for damages suffered as the result of my participation in or traveling to or from the said event. I specifically release and discharge said operators and sponsors from all injuries or damages arising from any negligence on my part or any negligence that may occur based upon my physical fitness or my willingness to participate in such event. I also give my permission for the free use of my name and pictures in any broadcast, telecast or other written account of the event. I understand that the Lexington County Peach Festival and/or anyone connected with it shall be harmless from any and all losses, known damages, injuries, causes of action, or judgments by any parties that may occur. Thank you for your entry! Your application has been received and will be reviewed! Please allow up to 5 business days to receive confirmation via email. You will receive your parade line up number at least one week prior to the Lexington County Peach Festival on July 4th. If you have any questions in the meantime, you may contact us.